A chandelier is a work of art, and especially this Divine chandelier by Lene Bjerre. It is artfully adorned with glass prisms and iron in antique silver color. The many sparkling prisms refract the light of 12 lightbulbs in a most delightful way. It will immediately draw attention and is the centerpiece of any room. No longer are chandeliers just at home in festive halls; today they also add special glamour to your very own living space. 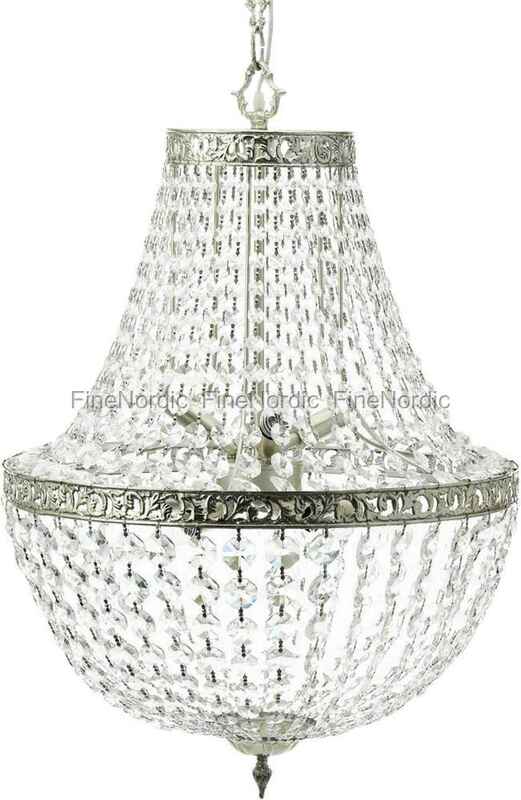 This Divine chandelier is equipped with a long chain and an attractive canopy. The length of the chain can be varied so that the chandelier looks just as spectacular from a high ceiling as from one with regular height. It spreads a cozy and comfortable feeling across the room and can be combined with any type of interior style and thanks to its timeless design, you have a chandelier for life. The large Divine chandelier weighs 17 kg.